Jansson was an impressionist painter born in Vermland, Sweden, emigrating to Chicago, IL in 1889. He studied in Stockholm, Christiania and Paris. He was a member of the Palette and Chisel Club, Chicago Art Club, Chicago Society of Artists, Chicago Artists Guild, Swedish American Arts, Arts League of Chicago. 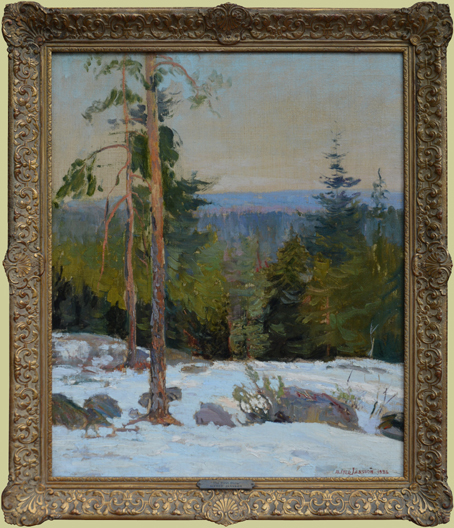 He exhibited at the Pennsylvania Academy of the Fine Arts Annual, the Swedish American Arts, Art Institute of Chicago. He has work at the Art Institute of Chicago, Swedish Building, and the Columbian Expo. Comments This painting is in excellent condition in a beautiful period gold frame, also in excellent condition. Alfred Jansson was an impressionist painter born in Vermland, Sweden, emigrating to Chicago, IL in 1889. He studied in Stockholm, Christiania and Paris. He was a member of the Palette and Chisel Club, Chicago Art Club, Chicago Society of Artists, Chicago Artists Guild, Swedish American Arts, Arts League of Chicago. He exhibited at the Pennsylvania Academy of the Fine Arts Annual, the Swedish American Arts, Art Institute of Chicago. He has work at the Art Institute of Chicago, Swedish Building, and the Columbian Expo.